An Egyptian man stands atop a pole in Tahrir Square on February 9, 2011, day 16 of 18 days of demonstrations that would lead to the resignation of Hosni Mubarak. 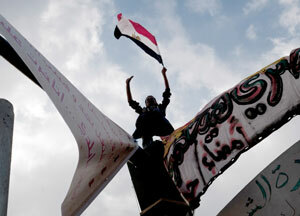 Critics argue that the Arab Spring has turned hope into despair and change into tumultuous chaos. Many writers and intellectuals have all but concluded that the so-called Arab Spring is nothing but a misnomer, and it was a dour winter all along. Furthermore, they insinuate that the hope that the Arabs were no longer peripheral to history was, in hindsight, premature. Many observers, however, seem to be oblivious to the fact that revolutions are processes marred by intervals of violence, reversals, abuses, and forward movements. True, the Sunni-Shiite schism is gaining in intensity, and regional powers are promoting it for their own designs. The much-respected Thomas Friedman of the New York Times initially praised the 2011 uprisings, but lately compares them to the Thirty Years War, which devastated the European territories of the Holy Roman Empire. Interestingly, religious wars in Europe had contributed to the advent of the European enlightenment where reason deemed to be essential for the interpretation of the scriptures. Yet, opting to avoid the imbroglio, other Arab intellectuals are falling prey to the comforting belief that the schism between Sunnis and Shiites is political rather than religious in nature. While that is largely true, it is hardly a reason for remaining silent. Argument over propriety of doctrine and political differences, emanating from the time of the great split in Islam, are a prevailing reality. Hence, they are being used by regional powers to inflame passions and to keep the “hegemony” of the other leading sectarian power in check. Many expected the uprisings to immediately and miraculously meet people’s expectations: reverse the economic decline, produce jobs for the unemployed, cleanse state institutions of corruption, and restore dignity and pride to oppressed peoples. That is a task too difficult to accomplish in decades; even in the absence of counterrevolutions and an inhospitable neighborhood. The legacy of tyrannical regimes is too complex and too entrenched to be extirpated in a short span of time. It seems, notwithstanding revolutionary antecedents, that the Arab uprisings are inexplicably held to different standards. The Arab uprisings were expected to accomplish, in their short history, what other revolutions accomplished in decades or even centuries. That is impossible. The challenges are many and the legacy is too burdensome. Many Arab Spring countries are moving forward, and some are, for now, retrogressing. Yemen is suffering from secessionist tendencies spurred on by the practices of the old regime. It is also going through a simmering sectarian conflict ignited, in the 1990s, by the weakness of the state and encroachments of sectarian ideologies from countries in the region. Sabotage of the infrastructure, including the electric grid, oil, and gas pipelines, is a daily occurrence. Al-Qaeda, an inherited legacy that was tolerated as long as it lent its murderous services to the regime, is active in many parts of the country. Defeating it is a Herculean task that requires patience, cooperation, and amelioration of the economic conditions. Like other Arab armies, except Tunisia, the Yemeni armed and security forces must be retrained to be a professional force with allegiance to the country rather to a regime or a family. Politically, the National Dialogue Conference has, with United Nations assistance, concluded its deliberations. To overcome the drawbacks of excessive centralism, the country now will be a democratic, pluralistic, and federated republic. Along with Tunisia, Egypt was predicated to have a smoother transition and avoid upheaval; both have institutions of a functioning state, and sectarianism and tribalism are not major issues for the two countries. The Muslim Brotherhood’s (MB) reign came to an abrupt end, partly because they were not inclusive, sought to dominate all levers of power, and lacked a coherent economic strategy. The “deep state” was too obdurate for the Morsi administration to overcome. The military coup, which evidently has popular support, rescued, in my view, the MB from its folly; with farsightedness, the parliamentary elections would have dealt President’s Morsi’s partisans a crushing defeat. Unfortunately, Egypt now is internally chaotic and externally isolated: its membership in the African Union has been suspended, and it is shunned by other states outside the Arab World. As evident from Secretary of State John Kerry’s recent shuttle diplomacy trip to push for Israeli-Palestinian negotiations, Cairo was no longer a necessary stop in his itinerary. Moreover, opposition to the restrictive policies of the new government is not confined to supporters of the MB; some liberals are expressing consternations at the press and demonstration laws enacted by the new authorities. The top three leaders of the April 6 Youth Movement, an important force in uprising against the Mubarak regime, are now incarcerated. Tunisia, on the other hand, is sputtering forward. The country’s political parties laboriously negotiated the Republic of Tunisia draft constitution, and the National Constituent Assembly (NCA) adopted it on January 2014. Subsequent to the formation of the National Elections Committee and the election of its chairman, Ali Laaraydh’s government resigned; a new one, mostly composed of independent technocrats replaced it. The new government will supervise the country’s transition to new elections. The Salafist Jihadi elements have retreated in the face of near unanimous opposition by the Tunisian people, which abhor extremism and fanaticism. In this regard, it is interesting to note that, although the Islamic Ennahda party dominates the NCA, the new constitution has guarantees for both separation of power and gender equality. Libya, on the other hand, is a security nightmare; but also a sputtering democracy. Like other Arab Spring countries, freedom of the press and freedom of speech are vibrant, and civil societies are mushrooming everywhere. Among the Arab Spring countries, however, the Libyan situation is sui generis: The Qaddafi regime left the country without state institutions. Apprehensive that military officers might challenge his authority, Qaddafi dissolved the national army and replaced it with brigades commanded by his sons and cohorts. Sharing of power and wealth, which existed prior to the Qaddafi 1969 military coup between the three constituent parts of the country, namely Tripolitania, Cyrenaica and Fezzan, were replaced by oppressive centralism. In the light of this, many Libyans in the east are clamoring for a federated state. Militias plague the country; some are Jihadist, claiming to have participated in overthrowing the detestable Qaddafi regime. They are a security challenge to the emerging order. Because of the absence of a capable national army, the Libyan government continued to relay on the services of these militias, which in turn blackmail it. Disgusted by their gangster behavior, the citizens of the capital and Benghazi revolted against the militias, particularly the Jihadist ones, and forced them to redeploy out of the centers of cities. Extremist Islamist overreach abetted by the Libyan Muslim Brotherhood is behind the latest flare of fighting in Benghazi and Tripoli. The MB in Libya is operating in accordance with the principle of excluded middle: the law barring opponents of the Qaddafi regime from serving, on the pretext that they have served Qaddafi in one capacity or another, irrespective of when and the duration of that service, is meant to exclude political opponents. Likewise, the interminable tension between different groups in the south is a problem demanding an attention; unless fairly addressed, festering grievances in the south will further complicate the political scene. Nothing evokes more pain and misgivings about the 2011 Arab uprisings than the bloodletting of the brutal war in Syria. The incarceration and torture of children in Dara’a in March 2011, who scribbled a few slogans asking President Bashar al-Assad to leave, was the catalyst of the revolution. Before the uprising, the Syrians lived a tolerant life; different sects coexisted harmoniously, though they were living under a politically repressive regime. The constitution of the country stipulated that the Baath was the leading party in the country, and membership in the Muslim Brotherhood was punishable by death. When the uprising gained momentum, Assad resorted to his killing machine, lest the thirst for freedom and democracy spread and undermine the legitimacy of the regime. The savagery of the regime was an intentional strategy to push peaceful protesters to violence, and thereby convince the Alawite community that they were the targets of the uprising. Unfortunately, it seems this strategy has worked. Syria now is in the midst of a ruthless civil war, which is made more complex by regional and extra-regional interferences. Although the situation remains perilous and the Assad regime has made recent military gains, it will eventually fall. After the damage done to the social fabric of the society, the human toll and destruction of the country vital infrastructure, the Assad’s regime has forfeited its legitimacy. In conclusion, it is obvious that, notwithstanding turbulences attending various transitions, it is too early to cast negative judgments about the Arab Spring. The 2011 uprisings were, indeed, motivated by a desire to reverse societal ossification. Given resistance to change by the old guards, violence was inevitable. Similar societal shifts—events, the world over—were likewise violent and chaotic. Sadly, it seems that the fruits of revolutions are unattainable without a great deal of human suffering. Abdullah Alsaidi was the Permanent Representative of Yemen to the United Nations from 2002 until his resignation in March 2011.